In 1493, Christopher Columbus “discovered” four islands that were already inhabited by the Ciboney, Caribs and Arawaks. But as we all know, this didn’t matter to good ole Columbus, and in honor of St. Ursula and her group of holy virgins, Columbus named the islands “the Virgins.” We now call them St. Croix, St. Thomas, St. John and Water Island. The U.S. Virgin Islands’ history is one marred by slavery under Danish rule but also triumph: On July 2, 1848, slaves on St. Croix rebelled and prompted then-Gov. Peter von Scholten to declare an end to slavery, which was abolished on July 3, 1848. But with the abolishment of slavery came an economic downturn for the islands after strict labor laws were implemented and natural disasters hit. Years after slavery was abolished, the Danish sold St. Croix, St. Thomas and St. John to the United States, on March 31, 1917, for $25 million in gold, and the islands became the U.S. Virgin Islands. As with most things involving the government, however, not everything was as it seems. Although the islands were an official U.S. territory, residents were not immediately granted citizenship, or the right to vote. One hundred years later, as the USVI celebrate the anniversary of Transfer Day—the day the Danish ceded the islands to the U.S.—all inhabitants are U.S. citizens, but many people are still wondering when they will ever get a chance to vote. 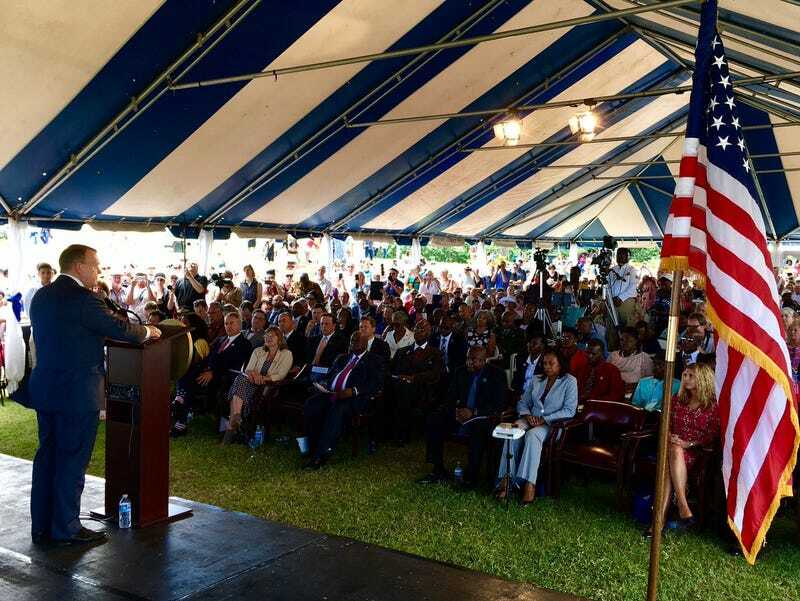 During the 2017 USVI Centennial Transfer Day event, held Friday, March 31, in St. Thomas, dignitaries from the local USVI and U.S. governments spoke about the meaning of the day, but two people stood out among the speakers. Stacey E. Plaskett, the Virgin Islands’ delegate to the U.S. House of Representatives, spoke about the history of Virgin Islanders being denied their voting rights, as well as the lack of funding for education and infrastructure within the territory. Plaskett stated that her main goal is to fight for U.S. territories’ right to vote for president. “Any proposal to give citizens on the Virgin Islands the right to vote has been denied by the United States,” Plaskett reminded the crowd. Her speech was met with applause as hundreds gathered in the legislative square in St. Thomas. Danish Prime Minister Lars Løkke Rasmussen, who also spoke at the event, mentioned the history between the Danish and the islands. Rasmussen said that as a kid, he wasn’t taught about the atrocities that Virgin Islanders faced at the hands of the Danish. “What happened in the past has affected where the islands are today,” he acknowledged. During a previous speech he gave at the St. Croix Transfer Day ceremony, Rasmussen delved further into the history of the islands under Danish rule. “The true heroes were the men and women who stood up to the injustice,” Rasmussen said. “I suggest we also look somewhere else in our hearts and minds. I suggest we ask ourselves, is there any justification for suppression? Any argument for treating people brutally? And we all know the answer; the answer is no. As part as his pledge to the Virgin Islands and to improve relations, Rasmussen announced that a scholarship was being created for Virgin Islander students. But what about reparations and an official apology? So far, the only apology for slavery has come from the Moravian Church in Denmark, which has had a presence in the Virgin Islands since 1732 and issued an official statement. There are many Virgin Islanders who feel that they are long overdue reparations from the Danish government, but just as some black people in the U.S. hope for the same, it’s probably best to call it a pipe dream. As you walk down the streets of each island, you’re not only reminded of the Danish influence on the islands that remains; you’re also quick to take notice that the streets that still bear Danish names are bustling with tourists. The residents take pride in being Virgin Islanders. As citizens of a U.S. territory, they’d take even more pride in being granted the opportunity to vote for president.